Hi everyone I'm Jack Red, a friend of mine introduced me to the classic Shadow Warrior. One of the toughest FPS ever made. You could consider it a counterpart to Duke Nukem 3D since the same team worked on both of them. Duke Nukem is parodying action movies while Shadow Warrior comes more off Material Arts movies. Lo Wang is possibly one of the most offensive FPS character ever made yet a lot of people loved him. This guy went through Hell to stop a evil tyrant from conquering our world. I actually own both versions of Shadow Warrior on GOG. You can get for free the classic version of it with the expansions included. I prefer the version I'm talking about today made by the same team behind Duke 3D: Megaton Edition. 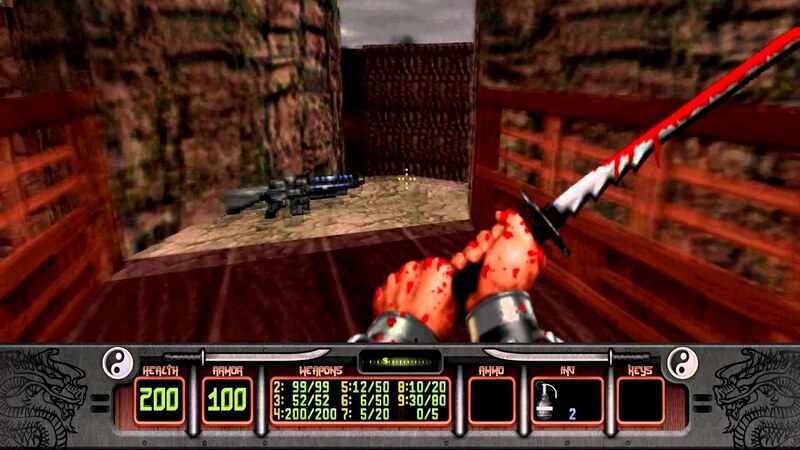 Shadow Warrior Classic Redux is hands down the definitive way of playing Shadow Warrior. For one one thing in the free version even if you did alter the controls. I still had a lot of trouble even doing simple things. For some unknown reason, Wanton Destruction's final level was missing a key portion preventing me from completing it. Thankfully that isn't a problem in Classic Redux version. The controls can be change easier in this version too making it a much better experience. Also considering this game can be brutal at times. Similar to Duke 3D: Megaton Edition, you have to select one of three games to play. Each one has a new main menu picture representing them more accurately. Originally not much changes in the main menu for the expansions. Personally I have a difficult time trying to play it without codes. I will be honest to say I'm better at other shooters like Doom, Duke 3D and classic Wolfenstein. Shadow Warrior adds many things that not many FPS still haven't done. You can use the turrets which is probably the most used feature in shooters today. You also can drive some vehicles although they aren't majority to do so. Mostly standard what you do but sometimes you have to figure where to go. My favorite part about Shadow Warrior is the music. WOW I could listen to those songs for many hours. I do like most of Lo Wang's voice overs as well. Can you believe there were several deals including Duke 3D? Although Duke 3D: Megaton Edition got pulled from Steam due to new ownership & the copy rights ran out. The new company behind that version of Duke 3D does now own Shadow Warrior franchise. Not including Shadow Warrior Classic Redux, they also made two new Shadow Warrior games. Unlike the original Shadow Warrior, these games are also on consoles. I would say Lo Wang stands out in many ways. Wanton Destruction ended up getting release more recently for free. What was left of the company did found the complete expansion to release it online. Prior to this Twin Dragons was the only expansion you could play. There are some notable changes in both expansions from the main game. Twin Dragons has Hung Lo, Lo Wang's evil twin brother as the final boss. They also animated the ending which wasn't common for Shadow Warrior. Wanton Destruction was stated to be their greatest expansion to any FPS game they ever done. Personally I felt that title should go to The Cryptic Passage for Blood for many reasons. Let's be honest if you aren't experience in these type of shooters. You could enable the codes or simply go play something else. Now Shadow Warrior does have some pop culture references as well mostly to TMNT. I really did try to like these games more than I ended doing. I am simply more for Doom, Wolfenstein 3D, Duke 3D, Blood and Redneck Rampage? Yeah I can't help I find those games simply more entertaining than Shadow Warrior lol.